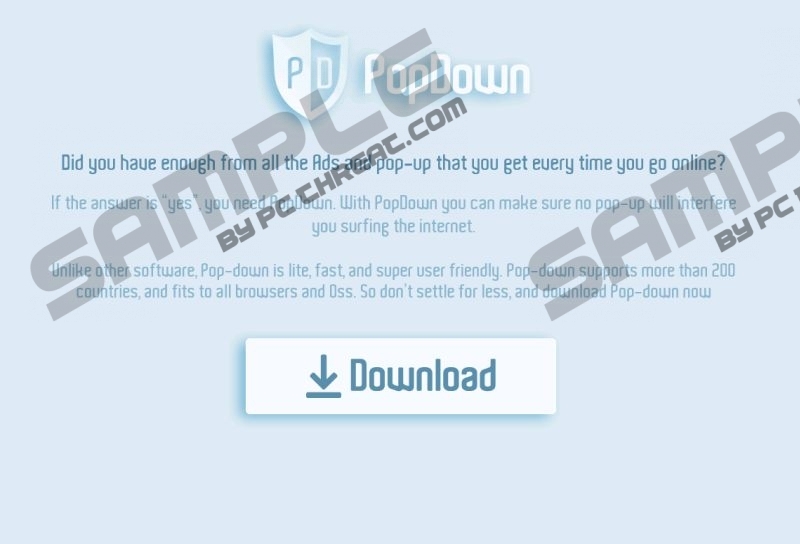 Popdown Steps is an adware program from the Lyrics family. This application says that it “can make sure no pop-up will interfere you surfing the Internet.” In addition, the program claims to be fast, user-friendly, and light. The program itself is not very prevalent nowadays. It is probably because it cannot be downloaded from its official website. Even though it is not very frequent, it might still enter your system. If you have already detected it, make sure that you get rid of it as soon as possible. There is no point in keeping this program installed because it will not do anything useful for you. We cannot say that this program does not do anything too. Specialists at pcthreat.com have noticed that this advertising-supported application will flood your screen with ads. Unfortunately, they will appear on your screen no matter which browser you use because Popdown Steps is compatible with all the browsers. These ads are really annoying and they might even cover the web pages you are browsing. In other words, they might interfere with your online activities. Popdown Steps does not look harmful at all and even its official website looks completely decent. Therefore, many users do not rush to remove it from their systems. In our opinion, you should do that as soon as possible because this program might not allow you to surf the web freely. On top of that, you might be exposed to potential threats. We cannot say that Popdown Steps is a harmful program; however, it might still cause harm to your system because its ads might redirect you to unreliable websites that contain malicious software. Not all the ads can cause harm to you, but it is still better not to click on all of them because it is impossible to say which advertisements are associated with unreliable web pages and which are not. In other words, you will not know where you will be redirected after clicking on a single ad. We agree with you that Popdown Steps looks completely harmless; however, we do not think that it is worth judging the reliability of the program from its appearance. According to our researchers, this program might not only redirect you to suspicious websites, but might also collect information about you. It says that it does not collect personal details, but we are not sure whether it is really true. Let’s say it does not record sensitive data. However, there is no doubt that it is interested in the web pages you visit, your search queries, and other technical details (e.g IP address and your approximate location). If you do not want to reveal any of these details, you have to eliminate Popdown Steps from your system. The sooner you delete Popdown Steps from your system, the better. Luckily, it is easy to do that because this program can be erased via Control Panel. Another way to get rid of this program is to scan the system with the SpyHunter scanner. You can download its free version from this website and then upgrade it. The upgraded version of SpyHunter will also protect your system from future threats, so we think that it is really worth investing in it. Launch RUN by tapping the Windows key and R.
Quick & tested solution for Popdown Steps removal.